The E.U. on Wednesday launched fresh action against Poland over its controversial judicial reforms, saying a new disciplinary regime for judges would have a “chilling effect” on legal freedoms. In the latest round of the bitter tussle between Brussels and the right-wing government in Warsaw, the E.U. said that under the new system judges would be punished simply for doing their jobs independently. The E.U. has already launched unprecedented proceedings against Poland over “systemic threats” to the rule of law that could see its E.U. voting rights suspended. "EU's capacity to uphold the #RuleOfLaw is essential. Separately 12 countries calling themselves “major partners” of Romania — Austria, Belgium, Canada, Denmark, Finland, France, Germany, Ireland, the Netherlands, Norway, Sweden, and the United States — issued a statement expressing deep concerns about Bucharest’s reforms. 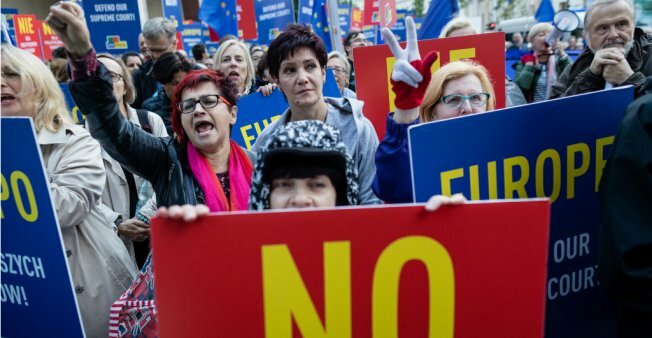 Steven Wolinetz, a professor of political science at Memorial University who has recently edited a book on right-wing populism in Europe, told The Globe Post that other than imposing article seven, there is “very little” the E.U. can do to penalize Poland for its reforms.